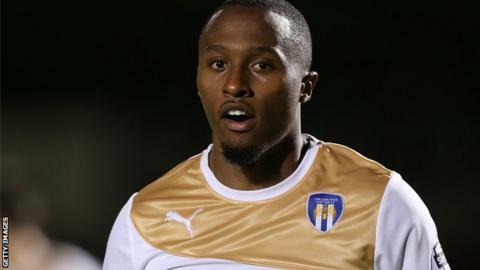 Colchester United claimed their fourth consecutive League One victory with a comfortable win over Bradford City. Callum Harriott opened the scoring when his low, angled drive snuck under keeper Brad Jones' attempted parry. Colchester grew in confidence before Marvin Sordell's calm finish, set up by Owen Garvan's reverse pass, extended their lead. Tony McMahon came close for Bradford in the second half, but his strike from 20 yards out hit the underside of the bar. Match ends, Colchester United 2, Bradford City 0. Second Half ends, Colchester United 2, Bradford City 0. Attempt missed. Mark Marshall (Bradford City) right footed shot from outside the box is close, but misses the top right corner. Tony McMahon (Bradford City) hits the bar with a left footed shot from outside the box following a corner. Corner, Bradford City. Conceded by Matthew Briggs. Substitution, Bradford City. Luke James replaces Billy Knott. Substitution, Colchester United. Chris Porter replaces George Moncur. Corner, Bradford City. Conceded by Tom Eastman. Substitution, Bradford City. Mark Marshall replaces Steve Davies. Attempt missed. Tom Eastman (Colchester United) header from the centre of the box misses to the right following a corner. Corner, Colchester United. Conceded by Bradley Jones. Attempt saved. Marvin Sordell (Colchester United) right footed shot from the left side of the box is saved in the bottom left corner. Attempt missed. Tony McMahon (Bradford City) right footed shot from outside the box is close, but misses to the left from a direct free kick. Tosin Olufemi (Colchester United) wins a free kick on the right wing. Attempt saved. Lee Evans (Bradford City) right footed shot from long range on the right is saved in the top left corner. Attempt saved. Marvin Sordell (Colchester United) right footed shot from outside the box is saved in the centre of the goal. Matthew Briggs (Colchester United) is shown the yellow card. Matthew Briggs (Colchester United) wins a free kick in the attacking half. Attempt missed. Lee Evans (Bradford City) right footed shot from outside the box is high and wide to the right. Second Half begins Colchester United 2, Bradford City 0.